1. Soak green in water for 5 to 6 hours. Cook for 10 minutes till boiled in water. Dip in cold water for a while. Drip dry. 2. 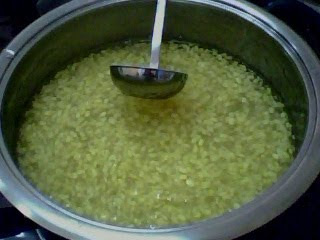 Steam the green bean till soft and expand. 3. Cook the ingredient(A) for 10 minutes until the sugar turns sticky. 4. Mix in 300ml water to the chestnut flour. Blend evenly then filter it. 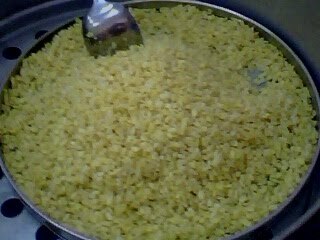 5.Boil ingredient (A) till boiled. Slowly mix ingredient(B). Then pour in the steamed green bean. Use small fire to cook till bubble. Scoop up in a bowl to serve with Ýou Char Kueh”.